*The Harrier "jump-jet" is a vertical-take off and landing aircraft that was designed by the British over a decade ago. The U.S. Marines use this plane to support their forces on the ground and also in a fighter role against enemy aircraft. The Harrier is a combat veteran in the Falklands War of 1982 and proved essential to the British victory. In close-air support missions, the Marines found the Harrier a capable aircraft effective in eliminating the menacing artillery barrages that were launched in the early days of Desert Storm. When the ground war began, Harriers were used to help breach the defenses of the Iraqi Army. Operating from Amphibious vessels off-shore and from small runways and land strips inside Kuwait, the AV-8 attacked Iraqi tanks and artillery while Marines took Iraqi P.O.W.'s. 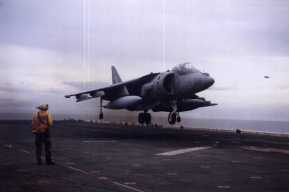 The AV-8 was essentially combat tested in the Falklands, but Operation Desert Storm has certainly shown many American commanders the capabilities of a vertical takeoff attack aircraft. Eighty-six AV-8Bs were deployed in support of Operation Desert Storm. Aircraft were based on the USS Nassau, the USS Tarawa, along with in Saudi Arabia. Harriers flew 3,342 sorties in more than 4,317 flight hours.